It wont come as much of a surprise that just like everyone else I love this time of year. I no longer feel guilty doing nothing on my day off and people don't think I'm crazy for eating soup every day. It dawned on me the other day that since I have my own place I can get super creative/make as much mess as I want for a Halloween party - fingers crossed I get the night off (if my manager is reading this I'll love you forever)..
Of course I headed straight to Pinterest for some decoration inspo and found so many awesome crafty ideas so I'm sharing a few with you today. This Pumpkin bottle storage is one of the best ideas I've seen and something I definitely want to try, but I'd probably chill bottles of Jagermeister and spirits rather than beer bottles.. 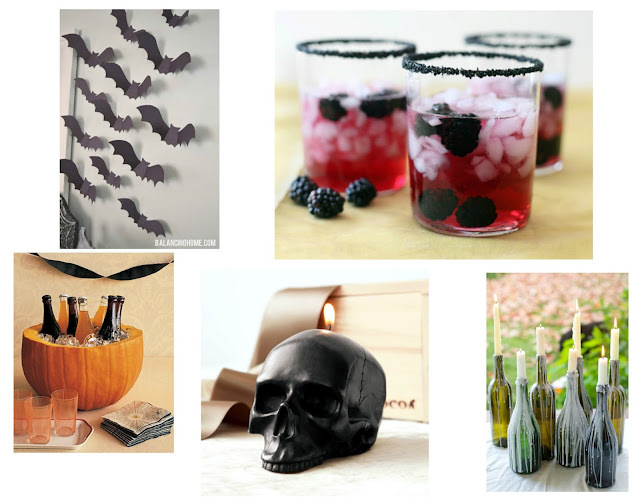 Drink responsibly kids.. One of my friends is also super crafty so as soon as I started to look on eBay for bat bunting she nearly died and suggested we made our own and there are a tonne of ways to do it from bin liners to black cardboard so I can't wait to give those a go! A good mix of dripping candles and the right lighting and I think I'll be good to go. I'm yet to come up with an outfit idea which is proving a total pain, and I don't want anything too mainstream so please no Where's Wally suggestions but if you have any ideas I'd love to hear from you. Just leave them in the comments or Tweet me @charlotterumsby.